NMC double sided floor sign. Reversible floor signs with two messages can be reversed when needed. This waterproof sign folds easily for convenient storage. Measures 12-inches length by 20-inches height. Header "CAUTION" and legend "CHEMICAL SPILL KEEP OUT" and "CAUTION - KEEP CLEAR HAZARDOUS AREA". 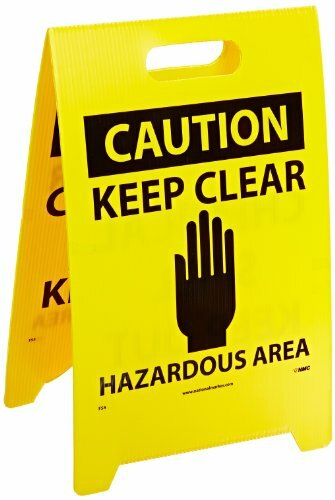 Header "CAUTION" and legend "CHEMICAL SPILL KEEP OUT" and "CAUTION - KEEP CLEAR HAZARDOUS AREA"